Here's a simple centerpiece I did last November for a little dinner party. 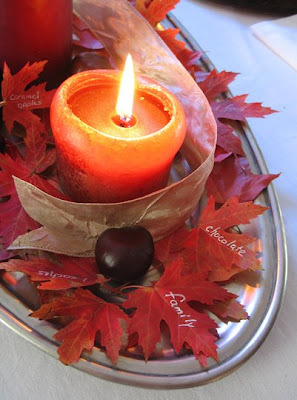 Casual as always, I pulled this Fall look together with things I had on hand: I used some heavy duty old-fashioned "dripless" candles, red maple leaves, chestnuts, satin ribbon and a large, oval pewter tray. I wrote things that I was thankful for on some of the leaves using a white paint pen. 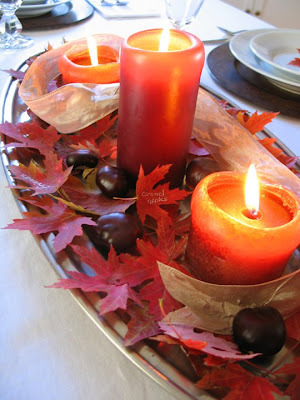 Please check out my other Fall posts for more seasonal Inspiring Ideas! I love it when it all comes together with things you have on hand! The idea of writing things you are thankful for on the leaves is wonderful! I just might have to borrow that one! Thanks. Very pretty! Thanks for the comment! I am now doing a giveaway... come back to see it! How very cute - love the writing on the leaves- great idea!! I just found your blog through a friend. Love your ideas. Thanks for inspiring me! I LOVE the leaves! Great idea! I am going to try tht with my kids this season! I love this! What a sweet idea to write things down... cute blog! 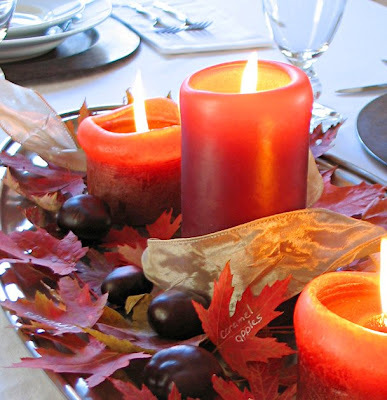 visiting via Heidi's Thanksgiving ideas post, great blog. This is such an elegant, yet simple idea, that I would't think of it, trying to do something elaborate that wouldn't look as nice. Great job! I would appreciate if a staff member here at jeannewinters.blogspot.com could post it. Thomas, I used a pewter tray. Not sure the link you're referring to ... But any mirror would look great with this concept! This is a inquiry for the webmaster/admin here at jeannewinters.blogspot.com. Greetings! Very useful advice within this post! It is the little changes which will make the greatest changes. Thanks a lot for sharing!